Brendan Bjorn has been steadily gaining weight since his PEG feeds have been increased over a very slow 20 hour timeframe. It’s working!! A legal matter has finally been resolved after a nearly 18 month wait, during which time we were left without any assistance such as Carer’s Allowance, One Parent family, winter heating allowance, and household benefit package (part of Carer’s). By the grace of friends and charity, we have survived. Recently, Declan volunteered to be a part of the MyNameIs campaign against child homelessness in Ireland. I helped him make a video to raise awareness. When we had spent a week in Dublin this past January, Declan was tremendously moved at seeing the vast amount of homeless people sleeping in doorways as we walked daily from Stephen’s Green to his class at the Gaiety School of Acting. This campaign has provided him – and all of us – an opportunity to speak out. I am tremendously proud of his compassionate heart! I found out that my blog has been selected to be on the longlist for an award in 2 categories – Health & Wellbeing and Parenting – with Blog Awards Ireland. Exciting stuff! Now to make the shortlist! The Environmental Health inspector came out to our current rental. Let’s just say the report won’t be pretty. I didn’t expect it would be. Once you have birds flying around in the dormer rooms, you know it’ll be bad. My well-worn accessible van died on the side of the M9 last week, leaving me and the boys stranded for a couple hours while we waited for the tow truck. In those 2 hours, I was on the phone non-stop trying to find an accessible taxi or an accessible van even to hire. It literally took me that long to find one! €280 to the taxi man and we got back to north Kildare. Social media. People can be quite cruel as they hide behind their keyboard and fire off slanderous statements, lies, and try to create hurt where none is due. I was at the receiving end of such ugliness recently and a friend let me know. I won’t lie, it hurt like hell to see, but I am grateful for someone looking out for me in this way. The ugliness is a reflection of those who spewed it. I will remember this as best I can and move forward from here. Last week, we had a rental bungalow pulled out from under us after being told we had been chosen for the lease and paying the deposit. I had already begun the process of getting Declan enrolled in the local school, told Brendan’s special school we found a place and would be there the first week of September, contacted a moving company, and all the other many tasks that come with moving a special needs household. But then it was pulled out from us for reasons that can only be considered as excuses considering the agent told me a friend of the landlord expressed interest in the house after I had already been told the lease was mine. To me, this is ugly business. You simply don’t do that to a family, especially to a child who has walked through the home and had begun planning in his mind how things would look. A child, who after months of fruitless searching with his mother and having finally been told this is his new home, began to feel secure in thinking he was settled at last. You just don’t do that…if you have integrity and ethics. Yes, it’s been a fortnight of very mixed emotions. There has been good, there has been bad and unfortunately, there has been ugly. All the while, the constant that keeps me going is the love I have for my 2 beautiful sons. They will be my inspiration, motivation and what fills my heart for as long as I live…and my heart couldn’t be more full of love for them than it is every single day! 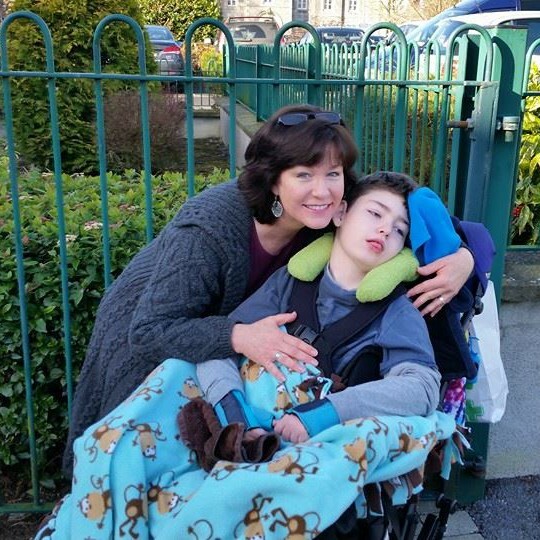 The house has been silent for nearly 2 days now as my 9 year old son, Declan, is away spending time with his Godmother at her homeplace in Longford. I haven’t handled it well. Last night, I found myself sobbing in a heaping mess curled up on the sofa after I spoke to him on the phone. He was having great fun, you see, and in my isolation stuck in the middle of nowhere with Brendan Bjorn, it was like a knife through my heart. He was having great fun, and once again, I wasn’t able to be the one having it with him. I don’t think most people can understand how I feel, so this is what I’m going to try and explain in this blog post. I want to be the one who is free. I want to be the one who is free to take Declan to local hurling matches no matter the weather or the rocky path to the pitch. I want to be the one who is free to go for a walk every day with him come rain or shine. I want to be the one who is free to run through the shopping centre carpark as we try to catch the film on time. I want to be the one who is free to introduce him to hiking, a past regular activity of mine that I’ve not been able to do in nearly 13 years now. I am a lone parent carer who is as restricted in her actions as is the precious son for whom I care 24 hours a day. I am a lone parent carer who is never invited over for dinner, for a cuppa, to a show or to anything, frankly. I’ve written a number of times about the mental health struggles of being a carer. When you add having no spouse/partner, that struggle is multiplied on many levels. When you add having no family, it is again multiplied. And when you add having no peers, no friends, who are nearby to socialise with, to support you, to comfort you, to help you, that struggle reaches an unsustainable level. Yet, despite having voiced all this before, silence remains. Even yesterday, when I replied to a tweet by a well-known counselor/therapist about the depression and isolation that comes with being a lone parent carer, the reply I received was “I’m really sorry to read that, Tracy. Life is very unfair. I’m at a loss for words.” I myself am a trained counselor/therapist, so I understand mental health quite well. This is how I know just how dark of a place I am in at the moment. And it is also how I know to tell someone that “life is very unfair” is nothing short of a cop out, especially from a trained mental health professional. This person missed an opportunity to reach out. But alas, no one really does anymore, do they? Please, don’t tell me life is unfair. I see the absolutely cruel unfairness of life every single day when I look at my precious son Brendan Bjorn as his body seizes, as he loses weight, as the scoliosis continues crushing down on his insides, as he becomes bedridden with pressure sores. I see it and I live it. Alone. What is unfair is that my 9 year old son has only a fraction of the mother he should have because she is left alone to try and be a full time nurse 24/7 to her other son. What is unfair is that people feign to care but aren’t willing to help carry the weight. What is unfair is that my severely disabled son, whose years on this earth are limited, doesn’t get out to see the world nearly as much as he should because his mother is exhausted, depressed, and some days simply too worn down to even get him out of bed. What is unfair is that I can’t afford to buy a proper WAV (wheelchair accessible vehicle) with an automatic transmission so I’m not in pain every time I drive. What is unfair is that I can’t afford to buy a secure, life-time home for my two beautiful sons to spend their remaining years together, while they have them, so to create memories which will last Declan a lifetime when that is all he has remaining. Instead, he worries about homelessness. What is unfair is having a letting agent scold me yesterday for being “impatient” when I followed up on a rental application, seeing me again in tears. A day in my shoes might fix that uncalled for attitude. What isn’t fair is having to worry about homelessness, surgery waiting lists, having enough money to buy groceries and pay bills, when all I should be worrying about is making sure the remaining years I have with Brendan Bjorn are filled with as much love and quality of life as it possibly can be. Please, don’t tell me life is unfair unless you walk in these exact same pair of shoes, because that isn’t fair. Asking the hard question: What happens when the adorable baby surrounded by hope grows up? What happens when the adorable baby surrounded by hope grows up? Yesterday, I read a bluntly honest article about this very question. This article, written by Victoria Smith, highlighted the international support surrounding baby Charlie Gard in the UK (who has now sadly passed on) and it addressed what many of us with older disabled children experience. Without holding back, readers like myself were taken through the range of emotions faced when community support disappears – as it inevitably does – once our disabled, medically fragile children are no longer babies that are surrounded by hope. So what happens when the adorable baby surrounded by hope grows up? And it is a sad fact, and a true fact, that families like mine are very often left to struggle alone in the years to come as our disabled child ages. Our local community (forget about the international community), even our own families and friends, disappear as quickly as they came…as quickly as the hope which once surrounded our precious child disappeared. We are then often faced with isolation and loneliness because not only has the hope of a miraculous cure or recovery faded away, but so too has our once passionate support network. We must ask and discuss WHY this happens. Babies represent life, full of hope and endless possibility. People across the world, from all backgrounds, can relate to this all encompassing, life-affirming symbolism of the hope for the future in seeing a lovely new born babe. When a baby happens to be seriously ill, as was little Charlie Gard, people will channel that hopeful energy into support, financial or otherwise, to (subconsciously?) do all they can for that hopeful belief in the future to not fade away…to not die…because that would mean facing our own inevitable mortality. Having said that, there is absolutely nothing wrong with this level of support. In fact, it is part of what makes humanity great! It is essential for the greater good. An entire community, country, even world, will get behind the fight for the care of a cute little baby, but when that baby grows over the years into a severely disabled young adult, then adult, where are all the people running to help that child and the parents? They aren’t there. There was no miraculous cure, no sudden healing. The hope of the future which they held onto is no longer there for the public, the community, the extended family and friends…and so they stop fighting for the care, they stop supporting the “cause” and they all too often disappear altogether from the lives of the family. Don’t give up on our children, no matter their age. Don’t ignore them. Don’t write them off as no longer being a “worthy cause” to invest time, energy or even funds, because not only were they never a “cause”, but because they were and always will be a beautiful soul dependent upon others to care. Don’t forget us, the parents, who are isolated as we try to hold on to hope – a hope that is now transformed into simply hoping to provide the best quality of life possible for our fragile child…that child who was once the adored baby surrounded by so much hope.